Hi, you guys! Long time no chat! I didn’t plan on taking the majority of the last 2 weeks off but my daughter had 2 tournament weekends in a row and I got SICK. I mean sicker than I have been since having the H1N1 Flu when I was pregnant with my youngest back in 2010. What started as a really bad cold, ended up turning into Pneumonia. I am on the mend now, but I am so behind on EVERYTHING. Being as sick as I was for a whole week combined with the all weekend tournaments will do that, I suppose. But I am so excited to be able to FINALLY share this latest recipe with you all! OH MY GOSH you guys. 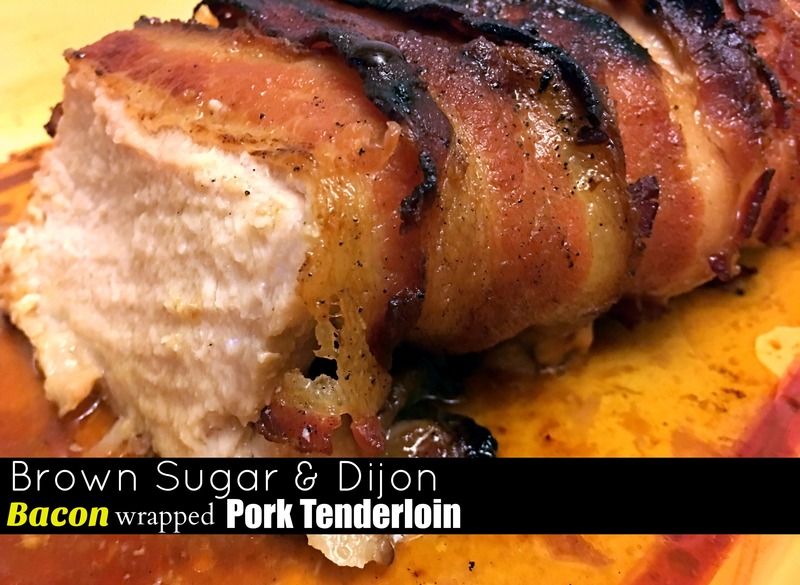 My husband isn’t a HUGE pork fan and he said this was one of the best recipes I have EVER made! I actually made it by accident too LOL. When I first felt my cold coming on, I did my grocery order online so I could just pick them up and not have to tackle the grocery store and spread my germs. I wanted some EASY meals so I had planned a couple of favorite crock pot recipes. I had meant to order a 4 lb pork loin to make my Brown Sugar & Balsamic Pork Loin (SO GOOD! ), but I accidentally clicked the wrong thing and I arrived home with a 1.5 lb pork tenderloin. I am NOT a fan of cooking tenderloin in the crock pot, so I decided to throw together a couple of ingredients that I had on hand and roast the tenderloin instead. I mean, what’s NOT to love about bacon wrapped anything? Right? Well the brown sugar, Dijon, & garlic combo I made to rub on the pork ABSOLUTELY made this dish. The flavor was TO DIE FOR good. Even my picky youngest who normally has to be ‘reminded’ to eat his meat, GOBBLED IT UP! Uncle Bee says he wants to try this one on the grill next and I can’t wait! I think it will be EVEN more amazing. I would DEFINITELY recommend using a meat thermometer for cooking pork tenderloin. You don’t want to over cook it! I absolutely love 5 ingredient (or less) recipes because they are just so easy! And BONUS POINTS when it turns out this amazing! This one is easy enough for a weeknight meal but amazing enough to serve to company. We served this with White Cheddar Mac and Cheese and Southern Style Green Beans the first time, and Fried Potatoes and Garlic Butter Baby Brussels Sprouts the second time. I hope you all love this recipe as much as we do! Place browned pork in the oven with an oven safe meat thermometer in the middle of the thickest part of the pork. Roast for 35-40 minutes or until thermometer reads 145-150 degrees F. Allow it to rest for 10 minutes before slicing. (The meat will continue to cook and the temperature will raise about 5 degrees while it rests) Remove kitchen twine or toothpicks, slice and enjoy! So sorry to hear about your pneumonia. A very similar thing happened to me in July 2014. Who dies of pneumonia in July??? This recipe looks amazing and we will try it very soon…thank you for sharing and I wish you a swift and complete recovery. Pneumonia is awful! So sorry you had it too. Antibiotics are amazing! I am feeling so much better. Now I am just trying to get caught up on EVERYTHING I got behind on while I was sick haha! Let me know if you try the recipe! Thanks for stopping by!